Hans Burgkmair was among the artists who introduced the Renaissance into Germany. He worked for the leading patrons of the day including the Emperor Maximilian I and Prince William IV of Bavaria. Burgkmair’s works combine Germanic elements with others of clearly Italianate influence and it is consequently thought that he might have travelled to northern Italy. In this Burial of Christ the artist focused on the transportation of Christ’s body, wrapped in the shroud. This episode is first depicted in the 15th century and was the subject of works by Mantegna, Dürer and Raphael. The stone that seals the tomb in the lower left corner of the panel bears the coat-of-arms of the Peutinger family, giving rise to the suggestion that this painting was part of the Crucifixion Altarpiece now in the Alte Pinakothek, Munich, commissioned by that prominent family. Isolde Lübbeke’s study of that altarpiece included a reconstruction that included this panel. Subsequent studies, however, have revealed differences in proportions and style, making her hypothesis unlikely. The Burial of Christ is now thought to be associated with a design by Burgkmair in the Nationalmuseum, Stockholm. Hans Burgkmair initially trained with his father Thoman Burgkmair then with Martin Schongauer in Colmar. In addition to his output in mural painting and altarpieces, Burgkmair was also highly active as a draughtsman, designing stained glass, commemorative medals and other types of decoration. His work as an illustrator was an important part of his output, and he experimented with the new technique of chiaroscuro woodcut. Burgkmair opened his workshop in his native city of Augsburg, which he left in 1503 in order to make a study trip around the Lower Rhine area and possibly to Italy in 1507. The artist secured important commissions from clients such as the Emperor Maximilian I, the Elector of Saxony, Duke William IV of Bavaria and leading families including that of Hieronymus Imhoff. On a horizontal panel, the artist depicts an episode within the narrative of the Holy Burial, when Christ’s body is carried in its shroud to the tomb. This specific scene within the story of the Holy Burial first appeared in art in the 15th century and its iconography was developed in Italy. The story of the Holy Burial, which was a popular theme in the late Middle Ages, is briefly mentioned in the four Gospels. In the Renaissance it was depicted by artists such as Mantegna, Raphael (in the celebrated painting of 1507 in the Galleria Borghese in Rome), and Dürer, in drawings of 1521 in the Germanisches Nationalmuseum, Nuremberg. 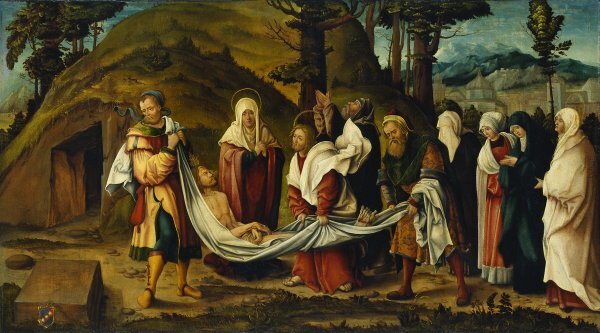 Christ’s Body carried to the Tomb was made known to art historians in the 1930s following the Munich exhibition. At the lower left corner on the front face of the block of stone that will seal the tomb we see the coat-of-arms of the Peutinger family. Above it are some initials that have been related to one of its leading members, Konrad Peutinger, who was also the intermediary through whom Burgkmair obtained his commissions from Maximilian I. Feuchtmayr considered that this panel may have been the central scene in the Crucifixion Altarpiece now in the Alte Pinakothek in Munich commissioned by the Peutinger family. Lübbeke published a photomontage of this altarpiece that incorporated Feuchtmayr’s suggestion and commented on the problems involved with this proposal, for example, the significant difference in proportion between the central panel of the altar with the Crucifixion and that of the Entombment resulting in a disjunction between the images. The second problem was the scant relationship between the present panel and the figures of Saint Sigmund and Saint George on the outer sides of the wings. Thirdly, Lübbeke emphasised the differences between the haloes and the colours of Saint John’s clothing in the Crucifixion scene and the present one. She suggested that the present panel might have been a predella panel for a similar altarpiece for which a drawing by Burgkmair exists in the Nationalmuseum, Stockholm. In that drawing Burgkmair proposes a Resurrection of Christ as the central episode, with an Entombment beneath it. With regard to its style and execution the present panel is close to two of the artist’s masterpieces: the Saint John Altarpiece and the above-mentioned Crucifixion, both in the Alte Pinakothek, Munich.